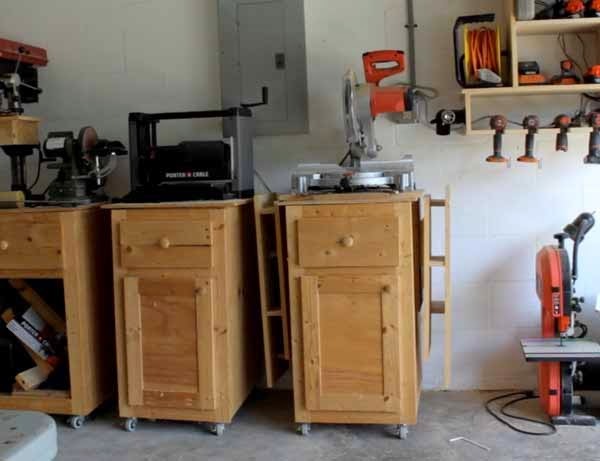 I like the idea of miter saw stations. The problem I had with them for a long time was the fact that they take up so much space. What if they didn't? Take up so much space I mean. Well I made mine fit in the space I had. You can too. 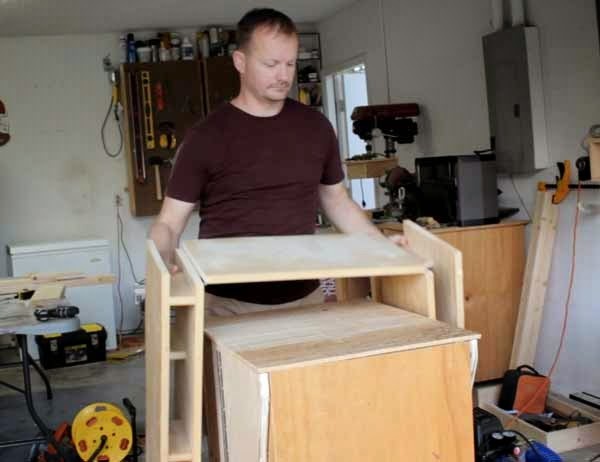 Click here for a cut list and materials for the roll around shop cart portion of this project. 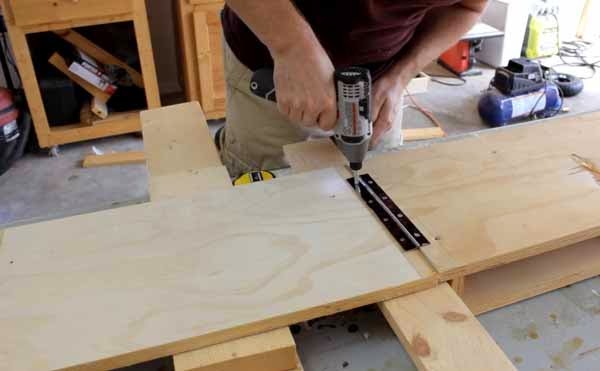 Click here for a cut list and materials for the miter saw platform section of this project. 2 pieces of 3/4" ply @ 12" x 12"
2 pieces of 3/4" ply @ 12" x 3"
2 pieces of 3/4" ply @ 10" x 3"
In my view, and my view only perhaps, it would be easier to assemble the miter saw base as instructed in its post. That way the whole top portion is one structure. The fold down wings of the assembly can be cut rather easily as shown in the video. 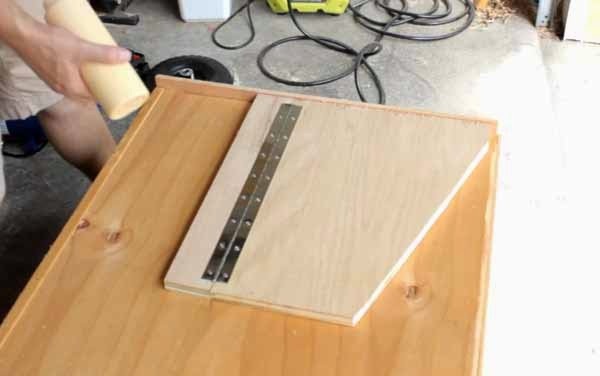 Attach piano hinges to the underside of the miter saw platform. You can have it delivered right to your door here. Do the same thing for the fold out supports. Attach the piano hinge. 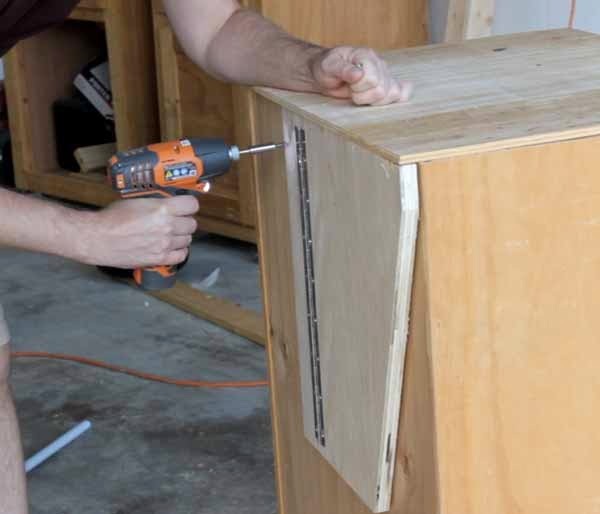 Then position the fold out support assembly on the side of the roll around cabinet and apply glue. After the glue was dry I further secured in place with a couple one and three quarter inch screws. I repeated steps 3 and 4 for the other side. Now we can position the miter saw platform, wings and all, onto the cart and secure with screws. 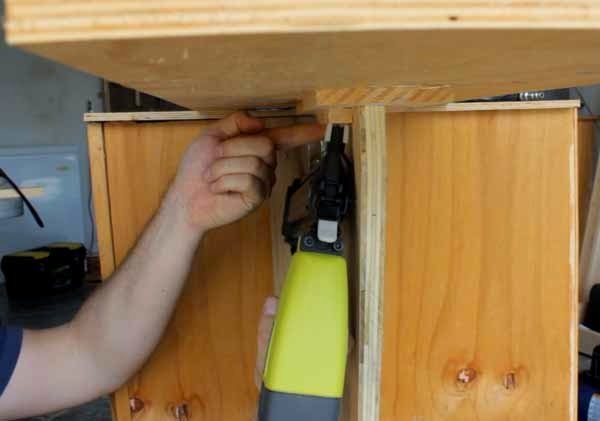 Likewise, position your miter saw as needed and secure with screws and washers. 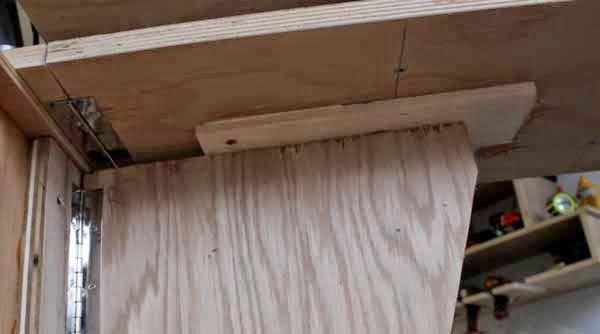 I cut a scrap piece of lumber to rough size and planed it down to an appropriate thickness in order to level the wings with the top of the saw. The disparity here comes from the fact that I mounted the fold out supports under the top instead of even with it. So we have to account for the 1/2" to 3/4 drop that creates. In order to keep the fold out supports from swinging to far forward we will tack a strip in place to act as a stop block. Fold it up and put it away! That's it. 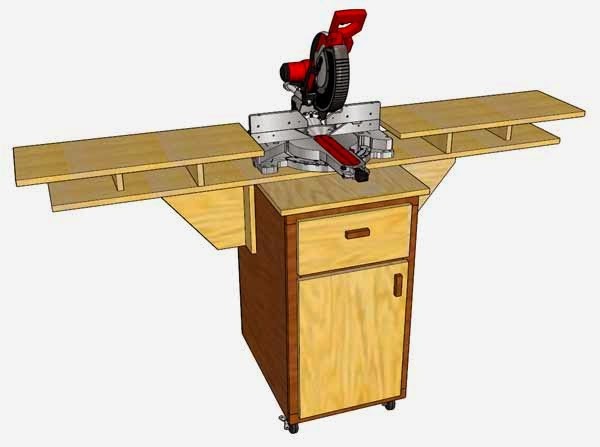 We now have a fully functional miter saw station that can be folded down and rolled away. Nice job! I knew you could do it! I have been asked what model saw I have and if it has been worth the money. 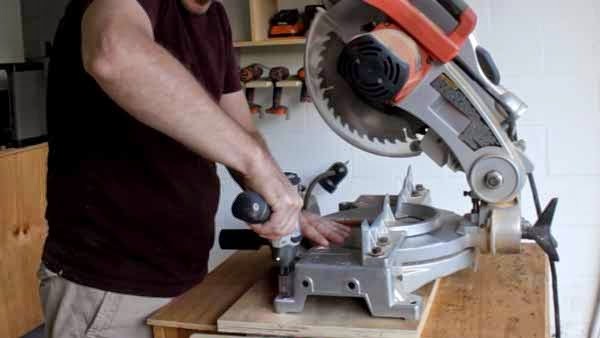 I do not endorse it to be the end all be all of miter saws. Then again I do not endorse any brand of tool to be that. I bought it and it works for me. I'll probably keep it until it breaks. The dimensions I used for the platform of the station are based on this model. FYI. As always if you have any questions, I'm here to help. 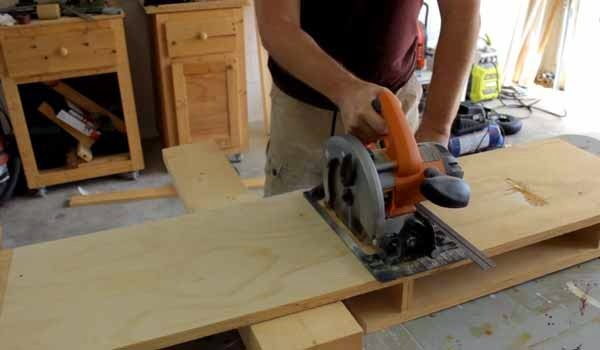 The mobile fold down miter saw station and additional materials is powerful and this project are using 7 step.When i need made the saw then i will discuss you. First of all thank you for sharing this. You just got yourself a subscriber.